Yesterday when we went for our periodical check up to our family physician, while sitting in the cabin waiting for the doctor to examine me, I was fiddling with a copy of Readers' Digest, the book which has a slew of memories connected with my girlhood days. Everyone must have some sort of memories associated with some specific books or songs or movies that string them to a a series of events of their life. Same was true for me with Readers' Digest. In my growing up days, subscriptions of some monthly magazines were regularly purchased in our home including Anandamela and Readers' Digest. We three siblings would engage in petty fights over our turn to get to read the books. I was the youngest and hence I was always the last to get my turn. Those days Anandamela used to be pretty informative with lots of curious and interesting facts explained in detail with fascinating snapshots riveting out attention. We all used to remain glued to it till we reached the last page. Same was with Readers' Digest. Through RD only, I came to know of a woman who was so possessive of her husband that she refused to share him with her children even. She suffocated about 7 of her children to death before they entered toddlerhood. Many such gripping stories and interesting phenomena that will bowl someone over filled the pages of RD. So yesterday while flipping through the copy of RD, I was in search for some intriguing piece of news that would leave a lasting impression on my mind or would at least provide me with a food for thought. I was not disappointed. Before long I came across a story about a man who found a wallet walking on a street. Out of the thought to get some information about the person the wallet belonged to, he opened the wallet and besides coins and bills, he came upon a letter written some 60 years back addressed to some 'Michael' from 'Hanna'. Hannah wrote the letter informing Michael about her mother's strong objection to their match because of which Hannah would not be able to keep in touch. There was an address written on the back of the letter which led the man to Hannah, now aged 76, bedridden in a hospital. At the sight of the letter, flood of memories rushed through her mind and she told the man how she never got over with Michael completely and never married. Upon meeting Hannah, the man came downstairs to the lobby and chanced upon a receptionist who identified the wallet as belonging to a patient called 'Michael' staying in the same hospital as Hannah. The man then met Michael who told him that Hannah and he were in love when he was 18 years old and she 16, but due to her mother's disapproval, they severed ties. However, unable to drive Hannah completely out of his mind, he too never married. The man then played the role of Cupid and united the estranged lovers who soon tied the knot and spent the remaining life with each other. Now I really don't know whether or not the above story has any kernel of truth but nevertheless, it aroused me emotionally and I couldn't help sharing the story with you all. 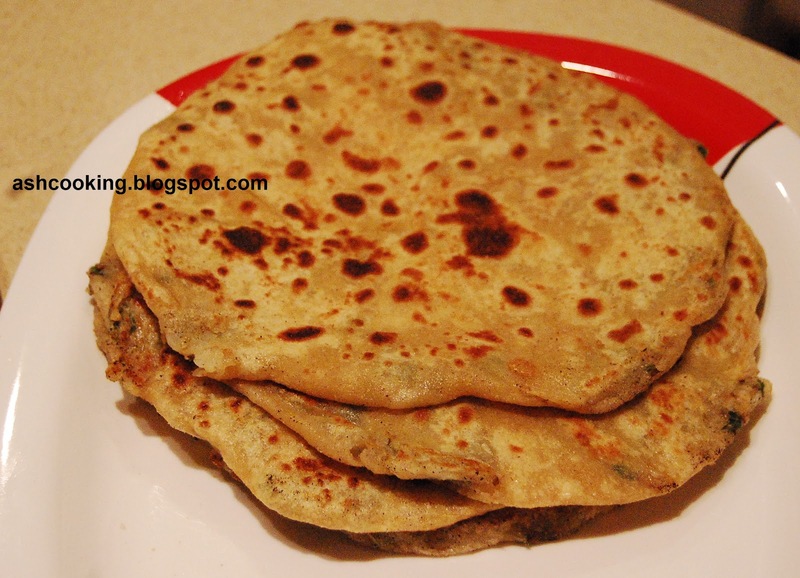 Back to the recipe, Aloo Methi Paratha is my favourite of all parathas. I love fenugreek leaves cooked with eggplant in Begun Methi, a few cluster of leaves used in making MethiParathas, a dash of methi seeds to conjure up Chicken Methi and finally mixed with aloo, it boosts the flavour of parathas to the maximum. 1) Add a pinch of salt and yogurt to wheat flour and knead dough. 2) Meanwhile, for the stuffing, mix dry mango powder, green chillies, coriander powder, ajwain, cumin seeds, ginger, fenugreek leaves and salt in to the mashed potato. Combine well. 3) Make balls of medium size out of the dough. Roll the balls out into circular shapes of 3 inches in diameter. Put a heaped tbsp of stuffing at the centre of the pancake and wrap it in by folding all sides. 4) Roll out again into the shape of paratha. Dust the parathas frequently while rolling to prevent the stuffing from coming outside. 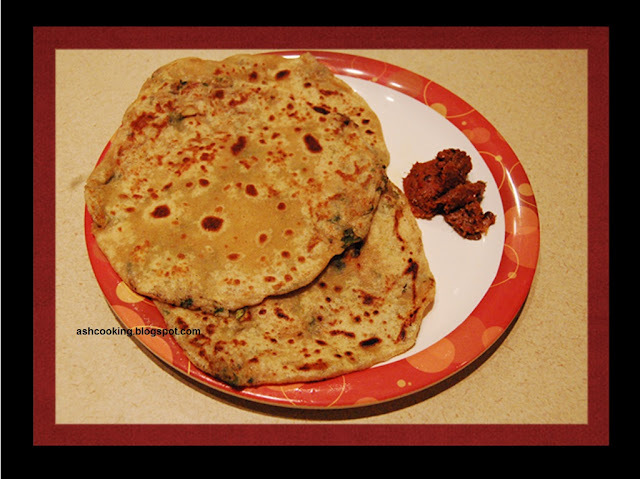 5) Roast the parathas coated in oil. 6) Serve hot with pickle or chutney.